Torrential rains and a tornado killed at least 30 people as storms battered eastern China this week, with millions more affected by flooding and other storm damage, state media and officials said Thursday. Twenty-seven people were reported dead in Jiangsu province west of Shanghai, and about 40,000 were evacuated, said Li Qiubao, an official of the Jiangsu Civil Affairs Bureau. Newspapers showed residents using makeshift rafts to ferry through flooded streets. A tornado also smashed through the town of Dafeng in Jiangsu, killing three people, the official newspaper China Daily reported. In neighboring Anhui province, another three people were killed, the China Daily cited Wang Haili, a local Civil Affairs Ministry official, as saying. It gave no details on the deaths. Wang said at least 44,400 people were displaced along the flood-prone Huai River. At least 349 people died in China last month due to flooding, landslides and other weather-related disaster, the government said. 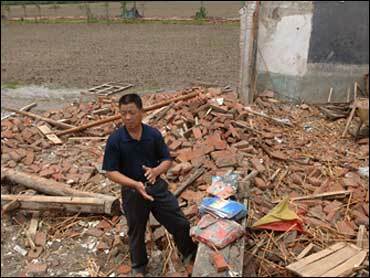 The official Xinhua News Agency said that another 99 people were still missing. Damage was estimated at $2.5 billion. China is expected to suffer from more typhoons than usual this year due to an unusually warm current off its Pacific and high temperatures over the Tibetan plateau.